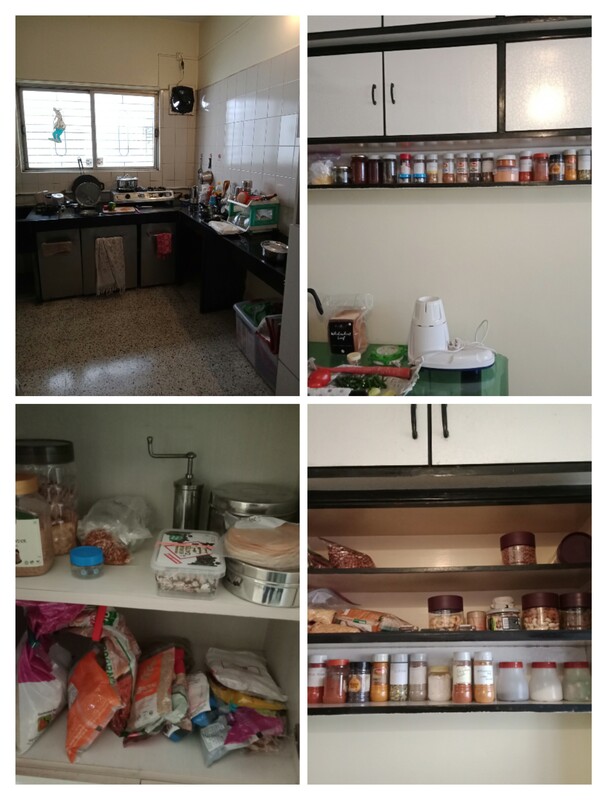 This post is specially dedicated to my childhood friend Adeeti… She wanted to know how we manage to travel with our kitchen. This post is also a way of thanking three innovators who made cooking while travelling so easy. With us being vegetarians, these innovations have made it even more easy for us to eat food cooked by us anywhere in the world. The first thank you goes to the folks who innovated on “hotels” and launched AirBnB. In 2007, Biran Chesky and Joe Gebbia hit upon the idea of sub-letting as a way to earn a few bucks and soon innovated it into AirBnB – extra homes or rooms that you have being let out as homestays to verified guests. A brilliant innovation as the costs for travellers is lower than what they will spend at a hotel and a great way for the hosts to earn money on existing property even as they get to meet new people. For travellers there are several advantages – getting to know new people and their culture, opportunity to cook their own meals as the Kitchen is available to guests in most AirBnB’s, staying in a home rather than a hotel, huge cost savings on laundry, food etc. The first Airbnb that we stayed at was in Patna last year and enjoyed the experience so much that during our Europe trip in September last year we stayed at different Airbnb’s for half the trip !! The other half of the Europe trip was spent in our friends’ houses :):). That brings me to the next innovation that’s not only changed the way we cook totally but also reduced my kitchen into two bags/one large bin. The One Pot One Shot (OPOS) method of cooking that Ramki has pioneered has made cooking anything, anywhere so easy and with just a 2 litre pressure cooker (aptly named the Magic Pot). For the Europe trip we just carried the Magic Pot with its inner vessel, measuring cups and dividers and a flat Induction Stove. I carried just a couple of masalas – garam masala, biryani masala and turmeric. We bought fresh vegetables and small quantities of provisions as required and cooked delicious meals everywhere. 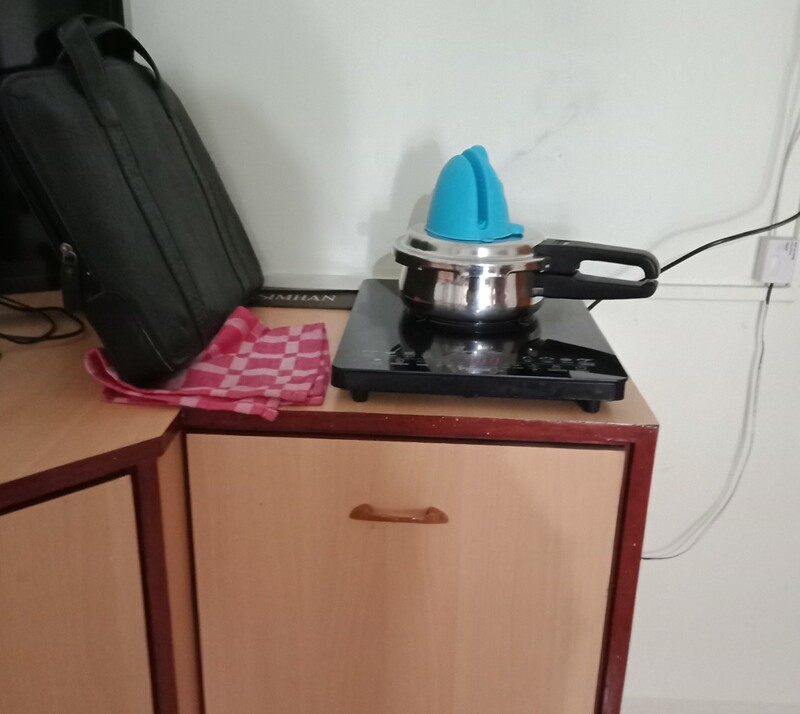 Now on this trip to Pune, I have carried just the Magic Pot (OPOS 2 Lit Pressure Cooker), the flat induction stove, one large steel casserole that doubles up as a Kadai, three saucepans that can be stacked and two sets of nested steel containers. My new love is the cast iron tawa for making dosas and rotis – have brought that along as well. I did pack all the masalas this time as we are bringing it in the car and there was enough space. I also brought along the leftover provisions from home so that we could use them up here in Pune, but have stocked up in small quantities here. The similar sized masala bottles are all the Roopak masala bottles that I have carefully collected over the years – They can take 100 grams of masala and thats just enough ! I have also got a set of 50 gm containers – the tiny blue ones in the picture above. These are the best if you are travelling overseas as you can carry some of the things that you might not get there – for instance Ajwain, or Star Anise or Elaichi or Pepper etc that may also be very expensive. These 50 gm containers can hold quite a bit, so they are very handy. The flat induction stove gets packed in the laptop bag thats to its left. Its really compact. Now the induction stove is such a blessing and whoever created it – has several people blessing him/her. My father would have loved to use it because for many years he kept trying to reduce the LPG gas usage by using the old electric coil stove. He belonged to the era that had to ration the use of the gas stove as the LPG cylinders were not available easily. While Amma still wants to use the gas stove, am a total convert to the induction stove. I just don’t need the gas stove at all, except for making “Bhakri”. (The millet flat bread). I am also uber finicky about the way my tea and coffee tastes. So I do carry the Wagh Bakri tea in a container when we are travelling within India. I carry the mortar and pestle – the tiny one to freshly grind some of the masalas. And I carry my coffee percolator with the coffee powder that I buy from Coorg or Sri Krishna Coffee, Hyderabad. If you don’t care so much about coffee and tea then you can travel lighter :). Some of the must haves to setup the kitchen anywhere besides the above – a handheld blender, and/or a mixer-grinder with a couple of jars, a good set of knives because you don’t get good ones everywhere and a masher. These help with preparing food from any cuisine. All provisions and fresh produce can be bought in the place you travel to. 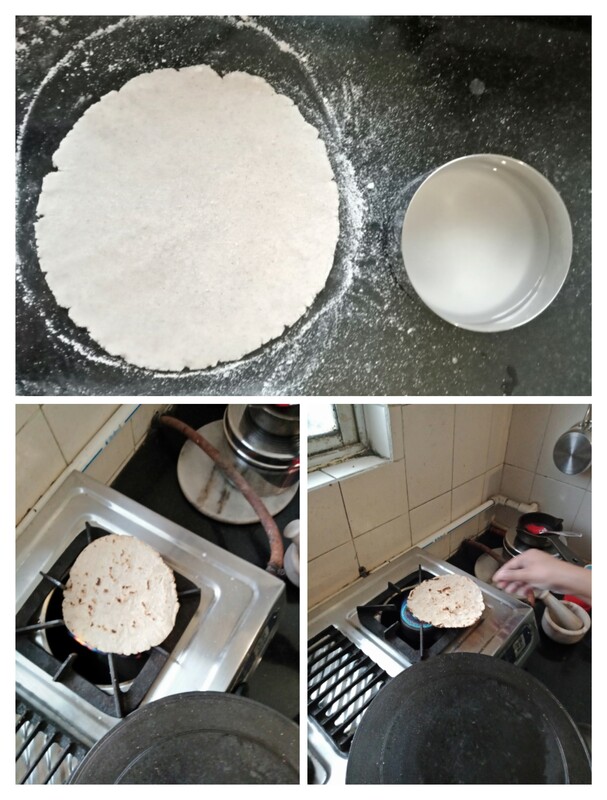 In this trip to Pune, I have learnt making the “bhakri” – its one of my all time favourite. I got the young girl who cleans up our Airbnb to show me how to make it and have made it a couple of times already. I am very good with the Jowar Bhakri but I struggled a bit with the Bajra Bhakri. I just remembered as I was writing this post that more than all innovators above – we all need to thank Thomas Alva Edison for electricity :):) without which none of the above would have been possible as easily. We still could have cooked using alternate sources of heat but electricity makes it so much easier. Hope this gives everyone a sneak peak into how to travel with your kitchen. Adeeti – ok? Note – OPOS, OPOS logo, One Pot One Shot & Flash cooking are registered. Please learn the methodology by becoming a part of the FB page – OPOS Support group or buy the OPOS Cookbook – 5 minute magic on Kindle. There are several other OPOS Cookbook titles available on Amazon now that give you the method and different recipes.